Before we got to Brisbane, I only had other people's opinions of the place to go by. The impression I got was that Brisbane somewhat lacked in character, culture or anything else that people look for in a city. Thankfully, it was all proven wrong (although maybe such claims might have been true 10 or more years ago). Today we were on our way to Canberra, and I had been given a less than enthusiastic appraisal of the city only last night by an old friend. Philby, as he is known to us lot back in England, was a lodger with me and my brother many years ago, but is now back in Sydney (although he originally hails from Auckland). I'd not got to see him while in Sydney, but did speak on the phone and his advice was: "Don't bother stopping in Canberra - there are much more interesting places near Melbourne." When we got to Canberra, our first stop was the tourist information centre where we picked up some useful local maps and leaflets and discovered that there were quite a few things to see, and many of them were free (always a good thing). 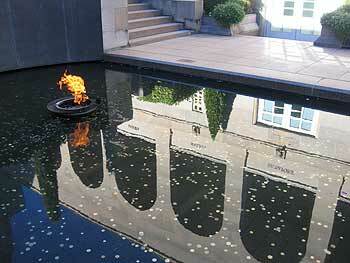 We then headed on to our first location - the Australian War Memorial. I thought that this would entail a few photos of the memorial building, a few photos viewed from the memorial building and then a quick exit on to the next attraction. In the end, we spent a good few hours here. Our photo tasks took little time, but we spent more time in reflective mood while walking past the walls of remembrance, almost overwhelmed by the numbers of names up there (over 102,000). 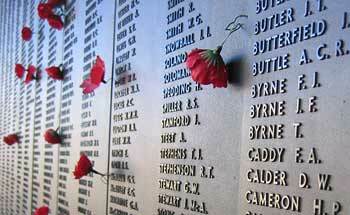 Alongside many of them were poppies forced into the cracks between the brass plates. The Wall of Remembrance, Canberra. Then we headed into the exhibition area - also free - and this is where we found the minutes and hours being eaten up. Now, I'm not a big fan of military history, have never paid too much attention to books about specific campaigns or military planes/tanks etc (although a well-written, well-shot film will always hold my interest, for example Band of Brothers , Platoon , Saving Private Ryan ). But this place really caught my imagination. There was a large section each devoted to the first and second world wars, another to other post 1945-conflicts and a special exhibition on Iraq and the part played by Australians. Aside from the usual smaller artefacts, there were helicopters and tanks from various campaigns, full-size recreated environments and some incredible small scale dioramas depicting key events of different wars. I could have easily spent a whole day walking around the exhibits, reading all the information panels and taking in all the minute details in the many dioramas. Another reason to go to the Australian War Memorial is for the view across Lake Burley Griffin towards Parliament House. It's no accident that the war memorial is clearly visible from parliament, a reminder for those who make the decision to go to war that more Australian names might be added to those already up there on the hill. 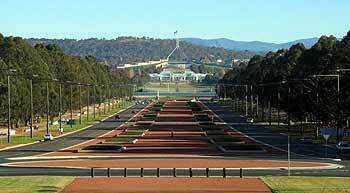 The view of parliament from the Australian War Memorial. We then headed into the shopping area of Canberra to do some menial tasks all too boring to write about here and before we knew it, it was time to find somewhere to stay for the evening. So instead of just passing through Canberra in double-quick time, we would have more things to investigate tomorrow. And for the record, if someone tells you that Canberra lacks character because it's planned and orderly, well that's not true. It has character because it's planned. It has character because of its modern buildings, a feeling of openness because of its spacious roads and airy public spaces. In short, it's just different from other Australian cities, but it is a difference that I rather like.